Once one of the world’s most famous aircraft designers, Russia’s MiG aircraft company has fallen on hard times. Though MiG aircraft continue to populate almost 30 world air forces, the firm has not won a major design competition or aircraft tender in its post-Soviet history. A In late March Russia finally admitted that they were having serious problems with their new “5th generation” T-50 (or PAK-FA) stealth fighter. The admission came in the form of a decision to cut the number of production T-50s to be built by the end of the decade from 52 to 12. Russia already has five development models of the T-50 flying, although one was damaged in a fire. The Russian announcement did not cover specific reasons for the change. But Indian Air Force officials have been criticizing the progress of the T-50 program for over a year. All the aerobatic teams of Russian air forces, including the latest one – Krilya Tavridi (Wings of Taurida), are going to take part in Army-2015 International Military-Technical Forum, RIA Novosti reports with reference to Commander-in-Chief of the Russian air forces Viktor Bondarev. By scrapping a deal for 126 MMRCA and opting to buy Rafale jets in a fly away condition under a G2G contract, the Indian Prime Minister has taken the suggestion of a Russian expert Konstantin Makiyenko, offered eight years ago, to develop and more easily procure upgraded aircraft for the Indian Air Force. Prime Minister Narendra Modi cut the Gordian knot of the US $ 25 billion ‘Mother-of-all-deals’ for the acquisition of 126 MMRCA by announcing in Paris last week that India will directly buy 36 Rafale fighters from the French aviation maker Dassault in fly-away condition under a government-to-government (G2G) contract. United Aircraft Corporation (UAC) is stating deliveries of a pilot batch of T-50 (PAK FA) fifth-generation fighters to Russian Ministry of Defense, president of UAC, Yuri Slusar, told RIA Novosti. MOSCOW, December 30. /TASS/. Fifty upgraded Mikoyan MiG-31BM supersonic interceptor aircraft will cover the most important strategic directions, including the Arctic, a Russian defense industry source told TASS on Tuesday. Russian President Vladimir Putin sees control of the Arctic as a matter of serious strategic concern for Moscow. According to the contract terms, more than 50 fighters modernized to the level of MiG-31BM will be delivered to the troops by the end of 2018. Russia’s Defence Ministry has signed a 30 billion rouble ($630 million) contract with a major state-owned aircraft manufacturer to modernize over 50 of its high-speed MiG-31 interceptor jets, the RIA Novosti news agency reported. The move comes amid a 20 trillion rouble ($500 billion) ongoing state rearmament program and rising tensions over Ukraine that have seen Russian jets repeatedly test the boundaries of NATO airspace in recent months. 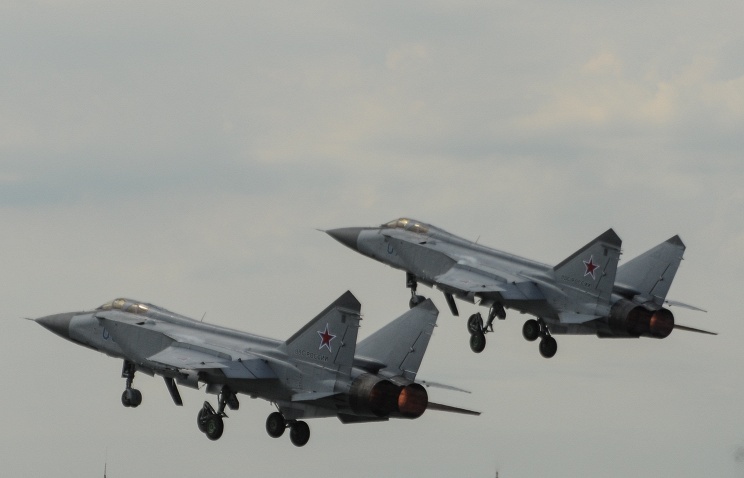 “The armed forces will receive over 50 modernized MiG-31s by the end of 2018,” RIA quoted Deputy Defense Minister Yury Borisov as saying Thursday. The modernization will be carried out by Russia’s largest aircraft manufacturer, United Aircraft Corporation. Once the PLA Air Force begins to put its 24 Su-35 fighters purchased from Russia into service, the Republic of China Air Force in Taiwan will no longer be able to match it in aerial combat, our sister paper Want Daily writes. Russia made the decision to sell 24 Su-35 fighters to China in 2012. Even though this number is only enough for the PLA Air Force to equip one of its fighter regiments, China is still capable of gaining the technology it needs to develop additional fourth-generation models from the planes. Joint projects with India such as the fifth generation fighter aircraft (FGFA) and a multirole transport aircraft (MTA) are priority projects for Russia, president of Russia’s United Aircraft Corporation (UAC) Mikhail Pogosyan said on Tuesday. “The projects of a fifth generation fighter jet and a military transport plane reflect our strategy on creating present-day high-tech products in cooperation with our partners,” Pogosyan said. The Russian Knights will demonstrate their aerobatics mastery at Airshow China 2014. The Russian Knights aerobatic team has qualified to perform on Tuesday at Airshow China 2014, Russian Air Force representative, colonel Igor Klimov said. “The Knights carried out a qualifying flight in Zhuhai and examined the region of upcoming flights. The training took 30 minutes; they flew in groups of five, four, and in a pair and also rehearsed individual aerobatics under both normal and adverse weather conditions. The qualifications commission consists exclusively of Chinese specialists who admit pilots to performance”, he conveyed.